by Melanie Mathos, Chad Norman. John Wiley & Sons, Inc., 2012. Melanie Mathos and Chad Norman are public relations and communication professionals who see contemporary social media platforms as effective communication vehicles. That premise leads the authors to suggest that non-profit organizations, such as congregations, can use social media to help them communicate better and help them meet their goals. Mathos and Norman identify five goals - “Set-up, Communicate, Engage, Fundraise, and Measure”- and offer tactics, or action items, to meet those goals. A few of the tactics offered are as follows: branding social media accounts; connecting platforms; creating Wikipedia entries; livestreaming events; how to create “like” campaigns; how to measure recommendations received via social media; and how to construct a “listening dashboard.” Each tactic specifies what is needed to complete the tactic and includes instructions for implementation. Many of the entries highlight a non-profit that has used the tactic successfully. The content is well organized; the writing is clear. However, this is not a primer on social media. 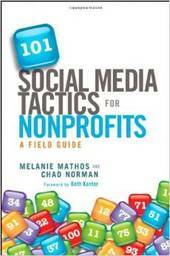 It is for those who already use social media and want some fresh ways to communicate and meet organizational goals.